Ancestry.com is slow to move on some things when it moves at all. Ancestry.com tags records to geographic locations to help users find them in their catalog and to help researchers find people in search results using geographic search parameters. That’s all fine and good when the materials are cataloged correctly. When they are not it’s another matter entirely and a good reason why searches should not always include as much geographic detail as a person knows. I’ve known for some time that the 1913 Hancock County, Illinois “platbook” was cataloged in Ancestry.com as being in Jo Daviess County, Illinois, instead of Hancock. I also know that the name of interest (Trautvetter) can easily get rendered in one of a variety of a ways when these old platbooks are read either manually or by some sort of OCR process. 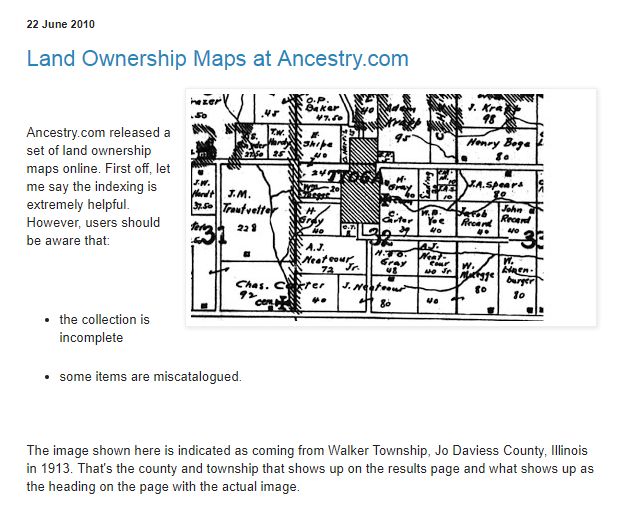 A search of “All U.S., Indexed County Land Ownership Maps, 1860-1918” at Ancestry.com for “walker” as a keyword in records tagged as being in Jo Daviess County in Illinois in 1913 was conducted. I knew the search results would sort alphabetically and instead of creating clever wildcard searches to catch the Trautvetter variants, I chose the keyword option as described. 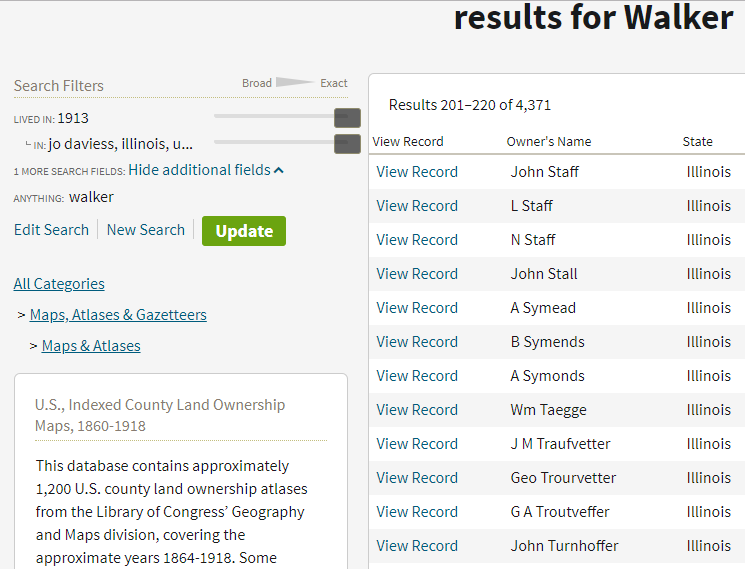 That also allowed me to browse all the entries that Ancestry.com showed as being in “Jo Daviess County” (incorrectly) in 1913 that had the word “walker” in their residence (coming from the Walker Township location). Many of these last names were ones that I recognized as living in Hancock County, Illinois’ Walker Township–including my Trautvetter family members. I scrolled through the search results until I got to the “T” section (they are sorted by last name by default). I knew there were Trautvetters in the atlas, but didn’t know how those names were indexed. The names of owners in the atlas are occasionally difficult to read so it was easy to see how the name was read as Traufvetter and Trourvetter in addition to the actually spelling of Trautvetter. The good news was that I found a reference for G. A. Trautvetter that I had overlooked earlier. We originally wrote about this classification issue in 2010. This appears to be a set of records that once they were uploaded to Ancestry.com just never got corrected. Try searching the Canadian census! Any year. The transcribed names are in any order other than numerical. You have to read the page of the census, not the transcription at the bottom. So many things at ancestry need to be fixed. It’s time for them to spend some money on fixing instead of advertising. I think they’re trying to get away from the document side and concentrate on selling DNA kits and the information they get from those kits. 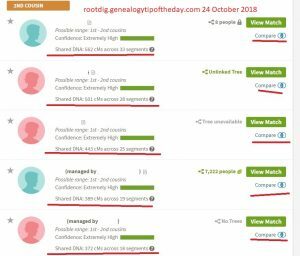 If ancestry allowed 3rd party uploads I doubt their DNA kits would sell as well as they do. Those of us who know better buy the kit there and upload the raw data everywhere we want to. It’s the best way to fish in every pond. If ancestry allowed uploads from other companies their DNA kits would not sell as well. It’s all about the money.